Description: Recommended enhancement: Hybrid. The darkness has cut right to the center of your being. You are no mere DoomKnight who serves the dark. You are a DoomKnight OverLord and the darkness serves YOU. Strike an enemy in combat (more effective on critical hits). Description: Magically torment your foe's mind, causing slight damage but also reducing their damage and crit. Damage increase with each additional party member. Description: Causes all foes within range to burst into flames, dealing moderate damage and causing them to burn for Damage over time. Effects increase with each additional party member. Description: Has a 50/50 chance of either stunning your foe a few seconds or giving you back some health. Healing effects increase with each additional party member. Description: Increase CRIT CHANCE by 12%. Description: Deals massive damage and significantly lowers your target's ability to hit anything for a short while. Note: Reduces hit chance by 50% for 16 seconds. Description: Your foe is attacked by its own shadow, dealing massive damage as it resists being pulled to the underworld. 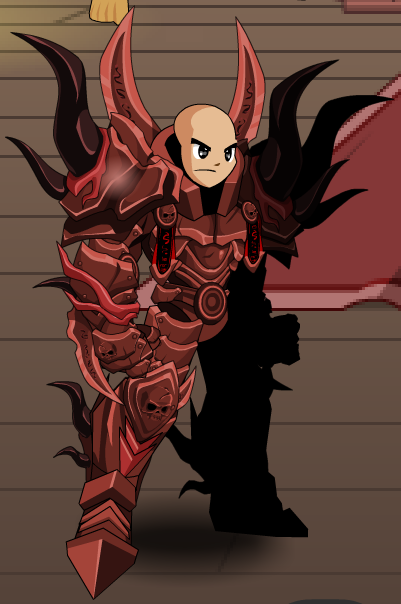 Previously called "DoomKnight OverLord Class". Thanks to Rezurrect and Shynk.